Do your students need to expand their math vocabulary? Can your students write math fluently? It's a skill that needs to be practiced and applied frequently. When students are writing and applying their vocabulary terms properly they are better able to express the content. Getting students to become fluent in writing math is necessary not only for speaking math, but also teaching it to others to demonstrate mastery. When students are able to write their math vocabulary terms in a sentence by themselves without scaffolded support, that is mastery. To get students to this point they need guidance with how to construct a sentence with the correct math terms applied. Giving students the practice in the classroom helps them to build math confidence in this skill and be better able to write extended responses on homework, classwork, and tests. The one question I'm always asked is, "How do I improve my students' test scores?" The answer is with vocabulary practice. Do you practice spelling words? Yes. Do you practice definition of words? Yes. Why would you not do the same with math terms? Math is a language that needs to be taught well to be spoken and written well. Teaching students to write math vocabulary in turn helps them to speak math vocabulary. 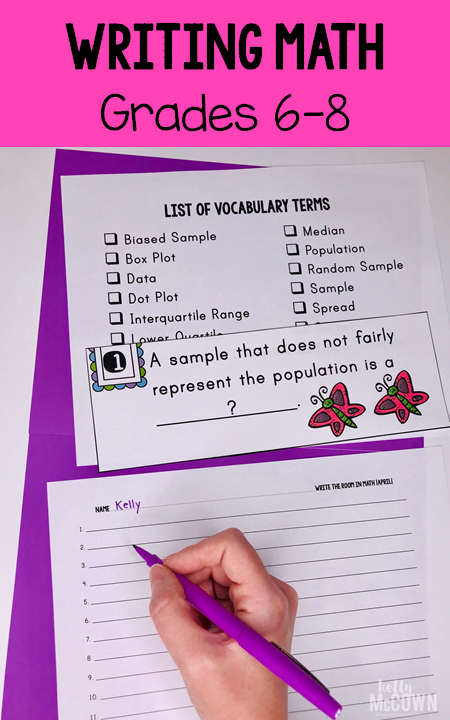 When you are using math vocabulary in your classroom on a weekly or monthly basis, you will see your students knowledge of content increase. Students need to know the math content inside and out so that they can make sense of it and explain it for themselves. It's simple, teach students to write math vocabulary and they will increase their math subject knowledge. Get your students writing math vocabulary in April with WRITE THE ROOM with Math. Students write key math terms, have scaffolded practice, and write their own sentences. Engaging students in writing math will have a great impact on their extended response skills.